"This is the perfect after-holiday-shopping martini!" 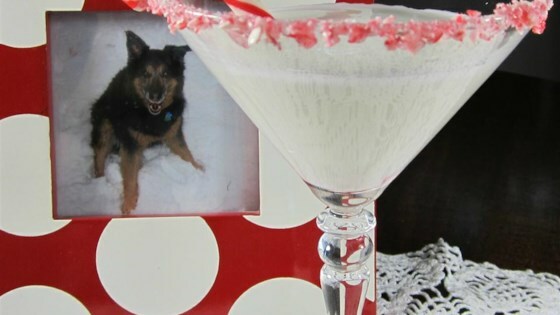 Wet the rim of a chilled martini glass with water, and dip into the crushed candy cane. Pour the vodka, schnapps, and half-and-half into a cocktail shaker over ice. Cover, and shake until the outside of the shaker has frosted. Strain into the rimmed martini glass, and garnish with candy cane to serve. MMM!! Great recipe!! The version of this recipe on FindGreatRecipes.Net is ALOT better though. If you're looking for a festive holiday drink to jingle your bells, you'll enjoy this. Made these for the holidays. Unfortunately, nobody at our party liked them. Too minty and just...not good. Personal preference I guess.